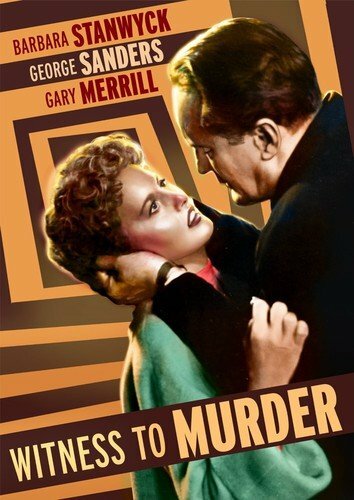 This is the first of three posts dedicated to The Second Remembering Barbara Stanwyck Blogathon being held over at In The Good Old Days of Hollywood and Maddy Loves Her Classic Films..
Brief Synopsis – A woman witnesses what she suspects to be a murder from her window but no one believes her besides a curious detective. My Take on it – This is a film tat I knew nothing about before seeing it but the premise made it sound quite interesting. They do a wonderful job here making this story thrilling as they take the concept to a higher level once they add in the whole psychological aspect of things. Barbara Stanwyck is great in the lead and makes us believe that she can even doubt her own suspicions as things move along. They find a way to keep things plausible almost the entire time which also helps add to the thrilling aspects of it all. One might even say that this film is slightly before its time since it is able to keep things very intriguing and thrilling the entire time even to the point where they make the viewer question what is truly going one and what the character actually witnessed. Bottom Line – Great thriller that takes the concept to a nice level since they get into the psychological aspects of things so well. Stanwyck is great in the lead and they do such a wonderful job making her doubt her own suspicions and it’s all done in a very believable way. In some ways this film is slightly before its time and manages to keep the story intriguing and thrilling throughout as they even find ways to make the viewer also question what really happened. Recommended! Pingback: THE SECOND REMEMBERING BARBARA STANWYCK BLOGATHON IS HERE – In The Good Old Days Of Classic Hollywood. This is a nice little time waster. George Sanders steals the show. Thanks for taking part in the blogathon Rob, and I’m really sorry for the late response. I love this movie. I’ve heard so many criticize this film because its very similar to “Rear Window” which was released the same year, but a few months later. Of course, “Witness To Murder” does closely parallel with the latter, but its also entirely different in a way too. It’s such a compelling and entertaining movie. I’m also hosting two other blogathons, and I would love to invite you to join in. Here are the links below.